You will need: A pen with a clean tip, paper, candle, and vinegar or lemon juice. SCIENCE EXPERIMENTS & AMUSEMENTS FOR CHILDREN BY CHARLES VIVIAN. Simple Technical Steped Practical Projects for school and college students. You will need: A pen with a clean tip, paper, candle, and vinegar or lemon juice. Invisible ink which becomes legible when exposed to heat really employs an oxidization process. For your ink you will need either vinegar or the juice of a lemon. Use a new tip in your pen or else thoroughly clean the old tip so that no trace of any previous ink remains. Even a sharpened matchstick can be used to write with. Pour a little vinegar or lemon juice into an egg-cup. Write your message in large letters on a sheet of drawing paper. When the 'ink' has had time to dry the message will be invisible. 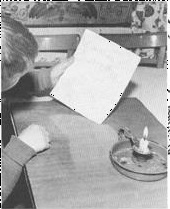 To make the message reappear, hold the paper close to the flame of a candle or facing a fire, and the writing will gradually appear. This is because the portion of the paper which absorbed the vinegar or lemon juice combines with oxygen from the air more easily than the untreated area of the paper, and the writing will show up as a faint brown scorching.